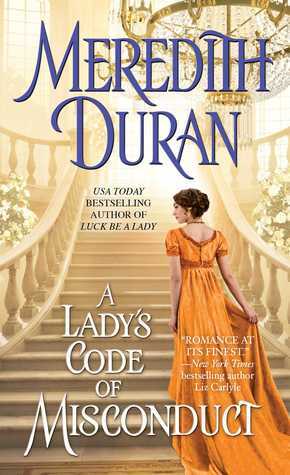 A Lady's Code of Misconduct is the fifth book in Meredith Duran's Rules for the Reckless series, but readers do not need to worry if they haven't read the other titles. This was my first Duran historical romance and it read like a stand-alone to me. The story sounds like a typical historical romance with the wealthy young woman needing the strong 'bad boy,' but Duran certainly adds enough twists and crafty plot turns to spin well-worn tropes on their heads (and then some). Jane is far from being weak of mind or body, and Crispin sounds like the usual dashing rake who rescues the distressed damsel. Ah, nope. This historical romance was unlike any others that I've read. I found the story line refreshing, tropes were shattered and recreated, the plot was smart and intricate, and the subject matter not only intelligent but extremely different. Politics, betrayal, redemption, a twist on amnesia, the book had so much going for it, the romance almost sat down and let everything play out for readers to follow along as the story unfolded. It's always marvelous to discover a 'new' author or to fully enjoy a story so much. 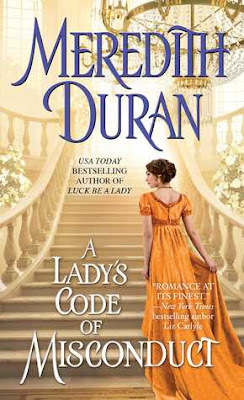 A Lady's Code of Misconduct by Meredith Duran just happens to be that book treasured read today. I gave it the highest rating I could and highly recommend it. Rating: 5!!! I loved it! 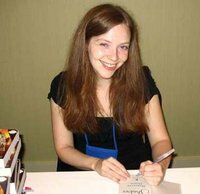 Cover art: Oh, Lady Jane, you are such a delight.